St. Martin's Press, 9781250161932, 208pp. The final book by one of America’s most treasured writers. In Points North, completed just weeks before his death, Mosher presents a brilliant, lovingly-evoked collection of stories that center around the Kinneson family, ranging over decades of their history in the Kingdom. 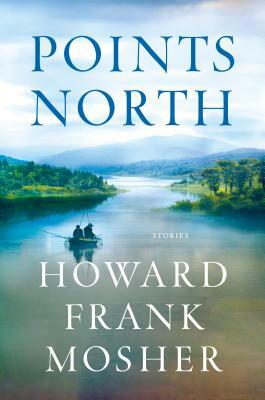 From a loquacious itinerant preacher who beguiles the reticent farmers and shopkeepers of a small New England town, to a proposed dam that threatens the river that Kinneson men have fished for generations, the scandalous secret of a romance and its violent consequences, and a young man’s seemingly fruitless search for love—Points North is a full-hearted, gently-comic, and beautifully-written last gift to the readers who treasure Howard Frank Mosher. Howard Frank Mosher (1942-2017) is the author of more than a dozen books of fiction and nonfiction, including Northern Borders and Disappearances, both made into major motion pictures. Mosher received Guggenheim and National Endowment for the Arts fellowships, the American Academy of Arts and Letters Literature Award, the New England Book Award, and the 2011 New England Independent Booksellers Association's President's Award for Lifetime Achievement in the Arts. Born in the Catskill Mountains, Mosher lived in Vermont's fabled Northeast Kingdom, "God's Kingdom," for all of his adult life.